The PMO (Project Management Office) is responsible for enterprise program and portfolio project management in an enterprise. This department is responsible for all aspects of PM including performance measurement and analysis, training, documentation, costs management, etc. Therefore, PMO is vital for change management and facilitating Agile adoption throughout the enterprise. 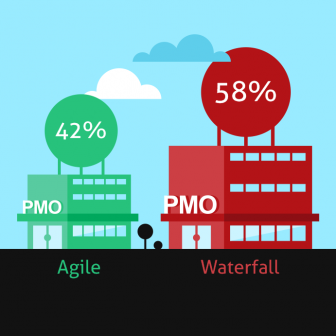 Historically the PMO has taken a process driven, inflexible Waterfall approach to project management. Even today, less than half of all projects use an Agile method, despite the overwhelming evidence of its benefits. A survey conducted back in 2011 by Forrester and the Project Management Institute revealed that only one quarter of PMOs preferred the Agile methodology. More recently ESI’s global PMO study from 2013 suggested that only 42% of projects have any Agile methodology associated with them. Since then, we have seen a continued and growing trend of Agile adoption. Another good indicator of Agile growth is the growing popularity of Agile project management training and certifications. According to PMI their PMI-ACP Management certificate has been a huge success since its launch in 2011, with over 2,000 certifications awarded by the beginning of 2013. UPDATE: For more recent data, check out our 2017 Analysis of Agile Adoption Trends! The growing awareness that most projects benefit from some element of Agile Methodology is fueling growing demand for certification, as well as an increasing need for collaboration across the enterprise. As the adoption of Agile is a cultural as well as a technical challenge, adequate software tools can greatly support the transition process. codeBeamer ALM helps the PMO by providing a structured way to adopt Agile or Agile-Waterfall Hybrid methods of development. As a holistically integrated ALM tool, codeBeamer supports collaboration, demand prioritization, a requirements management, as well as project and documents management. 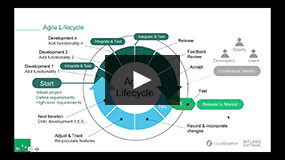 Where industry standards must be met, codeBeamer provides the means to ensure traceability and compliance throughout the development lifecycle. To learn more, contact us or start your free trial of codeBeamer ALM right away!